Tinnitus is the ringing in the ears heard by the patients in the absence of external sounds. The potential causes for the tinnitus could be the vascular, temporal bone dysfunction, inflammation in the ear, idiopathic, muscular spasms of the middle ear and palatal muscles, functional impairment of the eustachian tube, functional disorders of the jaw, and cervical spine. The author reported a 30-year-old female case who presented with the complaint of buzzing and hissing in the right ear accompanied by the stiffness in the head and neck. Patient had no past medical and surgical history of any ear problem. On otoscopic examination of the tympanic membrane by otolaryngologist no abnormality was detected. In the present case, the diagnosis was made as somatic tinnitus accompanied by reduced cranial sacral motion. The craniosacral osteopathic manipulation was performed which remains the only choice in such cases. In follow-up of 1 month, patient was doing well and is asymptomatic. Tinnitus is an abnormal hearing sensation in the presence of external sounds. It is more common in men than in women and in the individuals who smoke. According to the guidelines of the German Society of ENT medicine the tinnitus can be classified into subjective, objective, conductive, cochlear, neural, compensated, and decompensated tinnitus, respectively. The etiology of tinnitus is multi factorial in nature that includes vascular, temporal bone dysfunction, inflammation in the ear, idiopathic, muscular spasms of the middle ear and palatal muscles, functional impairment of the Eustachian tube More Details, functional disorders of the jaw and cervical spine. In the absence of any abnormality detected on otoscopic examination and magnetic resonance imaging (MRI) scans by the otolaryngologist and neurologist; the temporal bone patho-biomechanics should be considered as the cause. The diagnosis can only be confirmed by the presence of the somatic dysfunction classification – tenderness, asymmetry, restriction, tissue texture changes (TART) and also the reduced craniosacral motion and the rotational lesions of the temporal bone. A 30-year-old female patient presented with the complaint of buzzing and ringing in the right ear accompanied by the stiffness in the head and neck. Patient had been previously treated by the anti-allergic and nonsteroidal anti-inflammatory drugs in the various private hospitals for the last 5 months, but had no relief. Patient had no medical and surgical history. She underwent multiple investigations, all were found normal. On otoscopic examination performed by otolaryngologist no abnormality was detected; however, MRI scan showed benign temporal cyst on the left side. Temporal bone pathomechanical somatic dysfunction cannot be evaluated using the imaging studies. She finally underwent osteopathic assessment and was diagnosed with the temporal bone dysfunction, restrictions in the major diaphragms mobility leading to the diagnosis of the somatic tinnitus. The severity of tinnitus was evaluated using the Tinnitus Handicap Inventory Severity Scale (THISS) and was given Grade 3. Osteopathic palpatory examination demonstrated specific somatic dysfunctions by finding TART in the location of hyoid bone diaphragm, thoracic outlet diaphragm, abdominal, and pelvic diaphragm, respectively. The right temporal bone was fixed in internal rotation with an excessive tension in the duramater leading to the fascial imbalance. Neck movements in all directions are painless and full except at the end ranges. Postural examination revealed forward head posture with tenderness present at C0, C1, and C2 facets and spinous processes. Cervico thoracic junction showed bison's hump suggesting the fluid stasis. In view of temporal bone somatic dysfunction, the patient underwent osteopathic manipulative approach, consisting of all the major diaphragms' release namely pelvic diaphragm, abdominal diaphragm, thoracic outlet release, and hyoid diaphragm release, respectively. The emphasis was also laid on temporal fascia release, occipital atlantal release, frontal compression and lift, parietal compression and lift, generalized sphenoid basilar release was done. Mastoid wobble technique was used to synchronize the rotation motions of the right temporal bone. The dural tube rocking and CV4 techniques were also applied to influence the craniosacral mobility and cerebrospinal fluid flow. 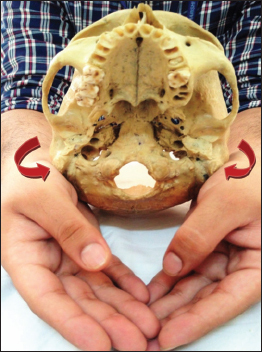 As demonstrated on skull model shown in [Figure 1], the Becker hold was used to provide an alternate pressure on and off to the temporal mastoids with thenar eminences bilaterally to synchronize the temporal bones motion with respect to the cranial rhythm palpated by the practitioner. 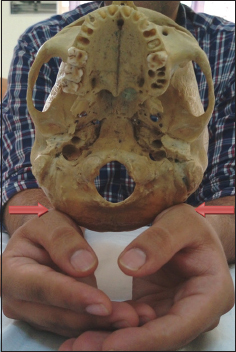 As demonstrated on skull model shown in [Figure 2], the practitioner was sitting at the head end of the plinth with the arms resting on it. The hands are kept closure to each other with fingers overlapped to cradle the occipital bone within bilateral thenar eminences placed lateral to the external occipital protruberance, but medial to the lateral angles of occipital squama. With the palpation of cranial rhythm, during the extension phase the practitioner applied minute pressure medially exaggerating the motion of that phase. The pressure was generated from the deep flexors of the forearm and maintained until the cranial rhythm stopped (and event also known as the”still point”). When a strong motion was felt bilaterally the resistance was then discontinued. The motion was followed and the cranial rhythm was reassessed. With the client supine, place one hand under the occiput and the other hand under the sacrum. Encourage a gentle rocking between the two ends using the craniosacral rhythm. The rocking motion addressed the rotational aspect of the occiput and sacrum until release restrictions of the transverse rings of fascia in the dural tube [Figure 3]. The more the rock, the better the dural tube releases. After three alternate sessions of osteopathic manipulative treatment (OMT) within a 3 week and home exercise program comprised cat and camel exercises and more of fluid consumption, the patient was reassessed and found to have decreased TART and improvement in the symptoms of buzzing and hissing in the ear along with reduced stiffness in neck region. At the 1 month follow up, the patient is devoid of all symptoms and living well. In the present case report, the patient demonstrated the dural tension, reduced mobility in the abdominal, thoracic diaphragms, and also the internal position of right temporal bone. These all directly and indirectly influence the mobility of the basisphenoid and the reciprocal tension membranes in the synchronize manner. The dysfunctional temporal bone leads to the venous stasis and the retention of the metabolic products, increased toxicity which could further lead to the reduced axonal activity and synaptic transmission and hence to the production of the tinnitus. Somatic dysfunction is defined as “impaired or altered function of related components of the somatic (body framework) system: Skeletal, arthrodial, and myofascial structures, and their related vascular, lymphatic, and neural elements.” The palpatory osteopathic examination includes TART. The position of the temporal bone influences the position of the eustachian tube. The internal rotation lesion of the temporal bone in the present case report lead to the narrowing or closing of the eustachian tube. This closure leads to the production of the high-pitched tinnitus. The temporal fascia release and the mastoid wobble technique correct the temporal bone rotation lesion and improve the eustachian tube functional impairment leading to the reduced intensity of the tinnitus. Release of the thoracic outlet diaphragm, abdominal diaphragm, and hyoid diaphragm resulted in the improved venous and lymphatic drainage of the cervicothoracic region as evident from the reduced bison's hump in the present case report. This in turn prevents the backflow in the cerebral sinuses and hence reducing the dural tension. The osteopathic philosophy to patient care is a functional method of diagnosis and treatment that addresses the unity of body tissues, capitalize on structure – function interrelationships and augment homeostatic mechanisms. This patient care approach has shown to improve the somatic tinnitus in the present case report as evident from the reduction in severity of it from Grade 3 to Grade 1 as reassessed using THISS. The results of the present case report are bolstered by the study conducted by Amanda et al. This case report exhibits the importance and the efficacy of OMT for the management of somatic tinnitus. Further studies in the form of randomized control trials should be done to explore the effectiveness of OMT in tinnitus. Amanda B, Manuela M, Antonia M, Claudio M, Gregorio B. Posturography measures and efficacy of different physical treatments in somatic tinnitus. Int Tinnitus J 2010;16:44-50. Shargorodsky J, Curhan GC, Farwell WR. Prevalence and characteristics of tinnitus among US adults. Am J Med 2010;123:711-8. Feldmann H. Tinnitus. 2nd ed. Stuttgart: Thieme; 1998. Seidman MD, Standring RT, Dornhoffer JL. Tinnitus: Current understanding and contemporary management. Curr Opin Otolaryngol Head Neck Surg 2010;18:363-8. McCombe A, Baguley D, Coles R, McKenna L, McKinney C, Windle-Taylor P; British Association of Otolaryngologists, et al. Guidelines for the grading of tinnitus severity: The results of a working group commissioned by the British association of otolaryngologists, head and neck surgeons, 1999. Clin Otolaryngol Allied Sci 2001;26:388-93. Nusselein H. Entrapment Neuropathy of the central nervous system, unpublished lecture notes. Vienna: WSO; 2000. Lockwood AH. Tinnitus. Neurol Clin 2005;23:893-900. Glossary of osteopathic terminology. In: Chila AG, executive ed. Foundations of Osteopathic Medicine. 3rd ed. Baltimore, MD: Lippincott Williams and Wilkins; 2011. p. 1087-110.